The CTA and SDPBC negotiations teams met today to exchange the issues that will be bargained during 2018-2019 negotiations. Actual proposal language will be articulated at the next session, scheduled for January 29th, 2019. All sessions will take place in the board room of the school district to allow for proper video/audio recording and archiving to the school district website. This was a procedure enacted during the last round of negotiations (at the request of many of our members) to ensure greater transparency and the ability for all educators to view negotiations, regardless of their schedules. This means that the current round of negotiations is not “open book” and both parties are limited in the quantity of proposals they may put forward. As such, we are not capable of negotiating an unlimited number of items at this time. This is an important fact everyone needs to be aware of. 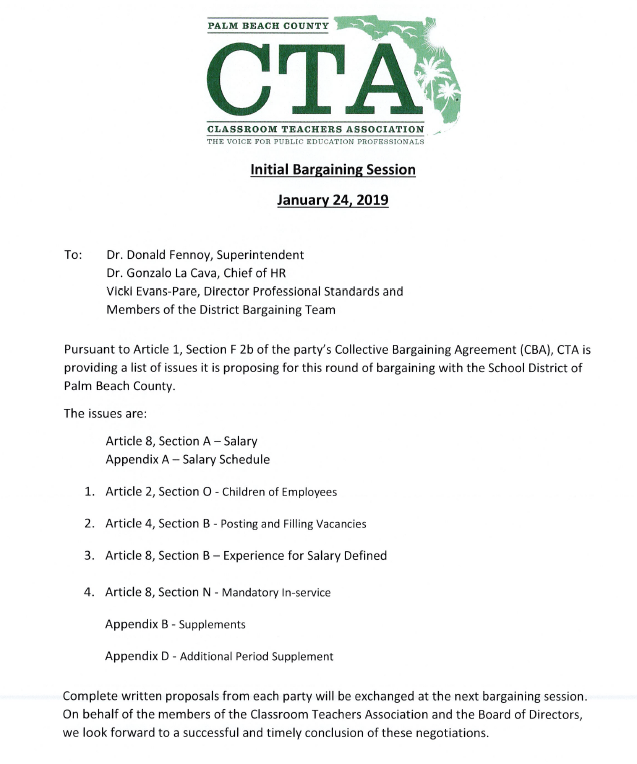 Your CTA negotiations team took into account a variety of factors (including member suggestions) when producing the CTA list of issues for the 2019-2019 negotiations. Below you will find both the CTA and SDPBC proposed issues.Remember, actual proposal language will be articulated at the next session, scheduled for January 29th, 2019.